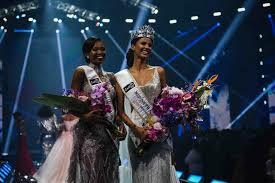 23 year old Tamaryn Green from Paarl in the Western Cape was crowned Miss South Africa 2018 during the annual event held at the Sun International's Times Square Sun Arena in Pretoria last May 27. She was crowned by Miss South Africa 2017 1st princess, Ade van Heerden. The new Miss South Africa is a 6th year medical student but will now have to postpone her studies as she steps into her full time role as Miss South Africa. Tamaryn will represent the country in Miss Universe 2018 later this year. Meanwhile, 26 year old Thulisa Keyi received the title of Miss World South Africa 2018. She is from East London in the Eastern Cape but now lives in Johannesburg. Thulisa will travel to Sanya, China to represent South Africa at Miss World 2018 finals on December 8. Completing the top 5 were Karishma Ramdev, Thandokazi Mfundisi and Noxolo Ndebele. The reigning Miss Universe 2017, Demi-Leigh Nel-Peters was a special guest at the event. 43 other former Miss South Africa winners including Miss Worlds Penny Coelen-Rey, Anneline Kriel and Rolene Strauss and South Africa's first Miss Universe, Margaret Gardiner graced the event celebrating it's 60th year.